Happy New Year Everyone. We just returned from Kyaik-Tyo Pagoda in the Mon Sate of Burma. Years ago I made the trek over the 33 hills to the base of the rock. At that time there were no foreigners as it was located in an insurgent area. The walk at that time was about 6 hours. One had to have special permission to visit. 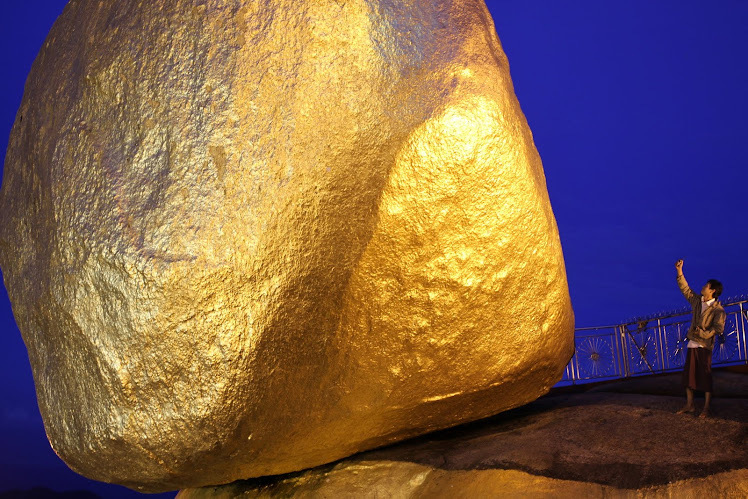 As you can see it is a huge boulder covered entirely in gold leaf many inches thick. This time my English friend and I had young muscular porters carry us pasha style in canvas slings which were attached to long thick bamboo poles up the mountain. Since it was the cold season there were at least 25 different varieties of moth including Saturnidae, Luna moths and some which were as metalic as silver. Nobody else stayed at our lodge so we had them set up a table for our dinner next to our rooms. At sunset a storm blew in and black clouds tumbled out of the sky above the red of the setting sun. happy new year richard..........glad you see you've popped your cherry at last. i'll come by and have a cold one with you soon.